There were a fair few things that I enjoyed that I haven’t really found outside of germany (currywurst anyone?) and a few things I’ve never heard of. It’s not big outside of Frankfurt and I think they’re even trying to apply for designated origin thingo for it. Basically, it’s a healthy, tangy sauce packed with herbs that goes fantabulously with boiled eggs, potatoes, frankfurts (of course) and other meat – actually, I think it could go with almost anything savoury. 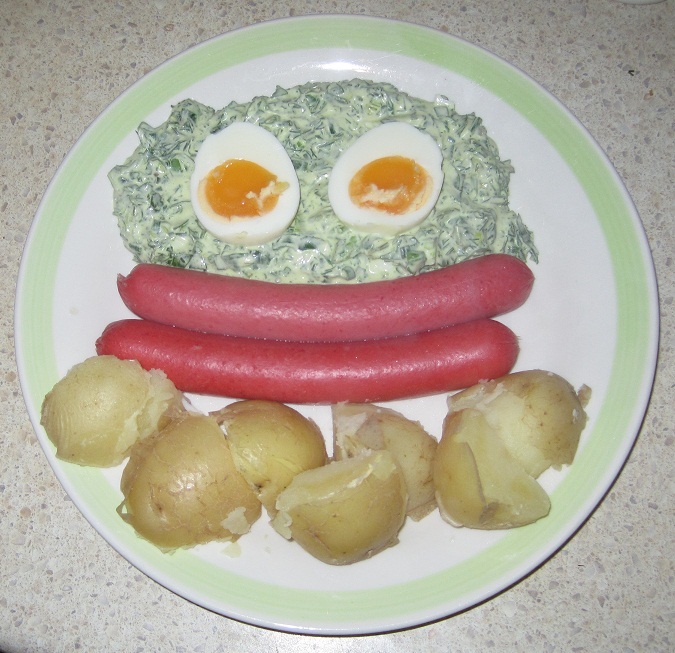 I was first introduced to the famed Frankfurt Green Sauce by a Frankfurter native. She taught me how to cook this dish – it is traditionally done with 7 herbs (parsley, chives, cress, chives, borage, dill, sorrel, chervil) but not all the herbs were in season or available where I’m located. In Frankfurt, if you go to the market, you can buy it already bunched into your 7 herbs. So here’s my improvised version of Frankfurt green sauce. You want roughly equivalent amounts of each herb (I was using celery leaves as a substitute for another herb but I find the taste is quite strong so I’ve used much less than equivalent). The rest of the ingredients are really to your preference. Taste as you go. Taste it, does it require more sour cream/yoghurt/mustard/etc? Then you’re done. 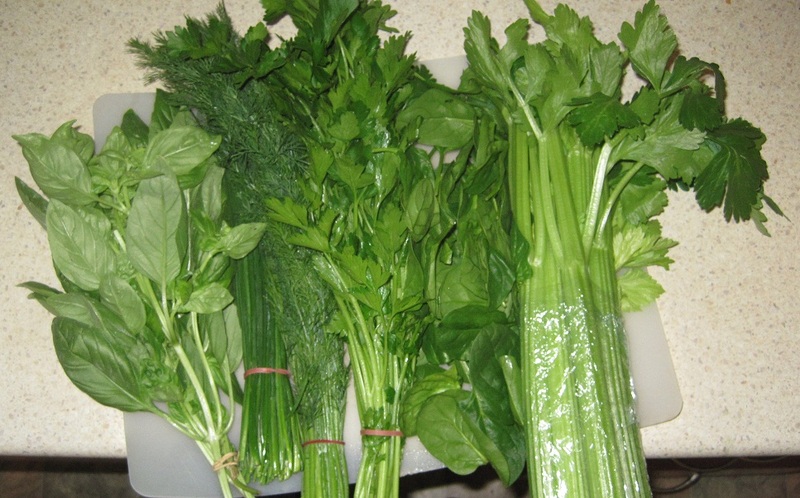 See how I turn this green sauce into a fab Halloween dish – post to come shortly. 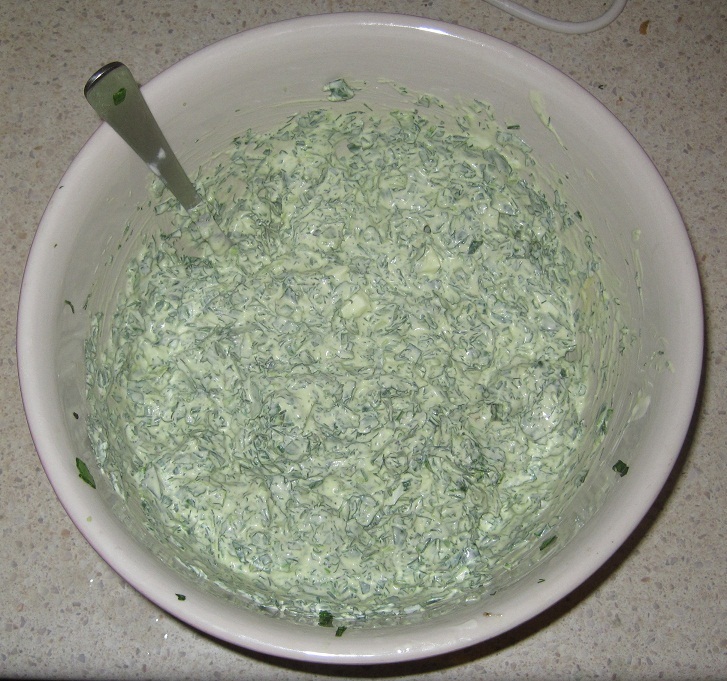 This entry was posted on November 5, 2011 at 11:28 am and is filed under 2 - Loveable :), Cuisine, German, Recipe Difficulty, Recipes, Sauce/Dips, Savouries, Simple with tags cooking, food blog, Frankfurt, german, Grüne Soße, Green Sauce, Gruene Sosse, recipe. You can follow any responses to this entry through the RSS 2.0 feed. You can leave a response, or trackback from your own site. The sauce sounds like it would be good with so many things. We just recently returned from visiting Germany but did not travel to Frankfurt. Now I will have a recipe from northern Germany. Thank you for sharing.